Root canal treatment is a common dental procedure performed to save natural teeth when they become infected on the inside. This prevents the need for extractions, dental implants, bridges, or dentures in future. Teeth are composed of three layers: the outer enamel, the dentin below it, and the inner layer of pulp. 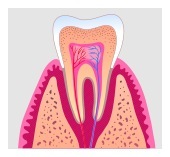 Dental pulp is comprised of living tissue, nerves, and blood vessels. If the pulp becomes exposed, through decay, cracking, or sudden trauma, the tissue will become infected and inflamed. The tooth will be very painful, and sensitive to hot, cold, and pressure sensations. The infection may even spread into the gums and cause an abscess. If you are suffering with infected pulp, root canal therapy is the treatment. During root canal treatment, the dead and dying pulp tissue is removed from the inside of the tooth. Fully developed teeth do not need pulp in order to function correctly. The inside of the tooth will be cleaned and the root canal shaped before filling and sealing it with special rubber-like material called gutta-percha. With modern techniques and materials, root canal treatments are much more comfortable and fast than in the past. After the procedure is complete, Dr. Karanth will place a dental crown on the tooth to protect it from future fracture or damage. After root canal therapy, a crown or other restoration will be placed to protect your tooth. It will be able to function without issue, just as the rest of your teeth, for the rest of your life. You may experience some sensitivity to hot or cold sensations, but these will gradually fade as the inflammation recedes and your tooth heals. Complications after this procedure are rare. To prevent further tooth decay or another infection, it is important to keep up with proper oral hygiene. The location of the tooth and the severity of the damage can all affect the price of your treatment. However, root canal therapy is far less expensive than the process of extracting and replacing the tooth with a denture or implant. If you are experiencing a toothache, it is important that you see a dentist as soon as possible. To learn more about root canal therapy, make an appointment with Dr. Karanth today. Your Farmington Hills Dentist, Dr. Karanth, of Pearl Dental provides the very best in root canal treatment, as well as general dentistry, pediatric dentistry, cosmetic dentistry braces, dental crowns and bridges, and more. We serve the communities of Farmington Hills, Livonia, Northville Township, Novi, Kenton and other surrounding communities. To schedule your appointment, call (248) 476-4416 or click on the link below to fill out the form.